A huge number of people in the world use wood fuel for cooking. Cooking over wood is very common here in Guatemala. Wood fires generally produce a lot of pollution and smoke, and result in deforestation in some areas. But wood is not such a bad fuel if we burned it more efficiently. The problem is that methods for burning wood are terribly inefficient. Most wood fueled cooking setups waste over 90 percent of the heat produced. The heat just goes off into the atmosphere and not into the item being heated. We also burn wood at a lower than optimum temperature, which results in wasted fuel, incomplete burning, and production of smoke. If we could raise the efficiency of the burning process and at the same time focus the heat produced into the cooking pot or other item being heated instead of wasting it, we could theoretically get the same cooking done faster, using a lot less wood, and producing a lot less pollution. Devices that burn wood more efficiently and that you can cook on are not that difficult to construct if you know how to build things from sheet metal and weld it together. And you’ll end up with a fairly large, heavy, non-portable device. But most people in poor countries do not have the ability to build such things and cannot afford to buy a large, heavy, and thus expensive device. In order to make an efficient wood burning device that is small and portable you have to use forced air. Well that’s out of the question in poor countries, isn’t it? But what if the device generated its own electricity to power a fan for the forced air. Way too complicated and unreliable, right? Perhaps not. Check out the BioLite. It’s a pretty neat idea. Happy 60th Birthday to the Transistor ! 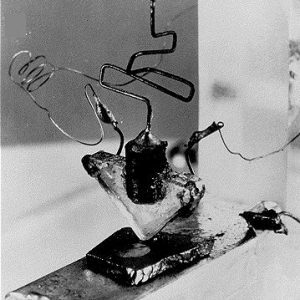 The first transistor was developed in 1947 at Bell Labs by William Shockley, Walter Brattain, and John Bardeen and it was made from germanium, not silicon. 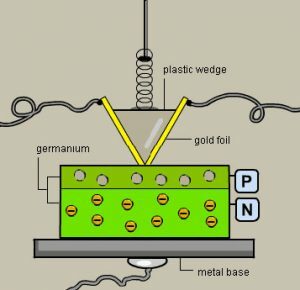 Germanium was used through the 50’s and into the 60’s before being completely replaced by silicon transistors. Those of you who are old like me will remember the first transistor radios in the 1950s. Before long there was a competition over the number of transistors in the radio. Seven transistor radios, nine transistor radios–a big advertising deal was made over the number of transistors and the consumer was led to believe that more is better. Around the time I got into electronics, around 1959, 1960, I disassembled a 14 transistor radio and discovered that several of the transistors were fake! (had only two leads, or had the leads twisted together) A good radio can be built with six to nine transistors but they added several fake ones to boost the count and fool the public into thinking it was a better radio. This was a interesting lesson. Throughout the 50’s and into the 60’s, transistors were made and packaged one at a time, and then assembled into circuits that you could see without your glasses and work on with your hands and a soldering iron. Plenty of transistors are still used as individual devices today, especially in high-power or radio circuits, but in 1959 Jack Kilby at Texas Instruments patented the first integrated circuit, where more than one transistor was fabricated simultaneously on the same substrate, along with components like resistors and capacitors to form a complete circuit that performed a function. The photolithography techniques used to “print” these circuits soon made it just as easy to make a miniature 20 transistor circuit as it was to make a single transistor and this was the way to the future. In 1971, Intel introduced the first microprocessor, a slow little 4-bit micro containing about 2,500 transistors. By 1975, Popular Electronics published the famous article that launched the personal computer revolution. It was an article on how to build a computer using Intel’s 8080 microprocessor. The 8080 contained about 4,000 transistors. Today the micro in your average personal computer contains about 500 million transistors. The latest dual-core server processors contain about 800 million. Your typical desktop or laptop computer today contains billions of transistors. 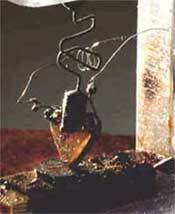 The simple transistor has come a long way.